For many years I was a breeder of tropical fish, and had visited a local pet store for supplies. This store had a reptile department that I would check out now and then, but never considered purchasing a reptile because I didn't want anything that would bite! One day while visiting the store, I noticed some funny looking, but cute baby lizards. I began asking one of the employees a bunch of questions about what they were, and when he told me 'they almost never bite', I wanted to hold one then and there. The gentleman handed one of the babies to me, and I was surprised to find that it was a little softer than it looked in the cage! Unfortunately, it was not possible for me to purchase a Dragon at the time, so I had to leave without it. 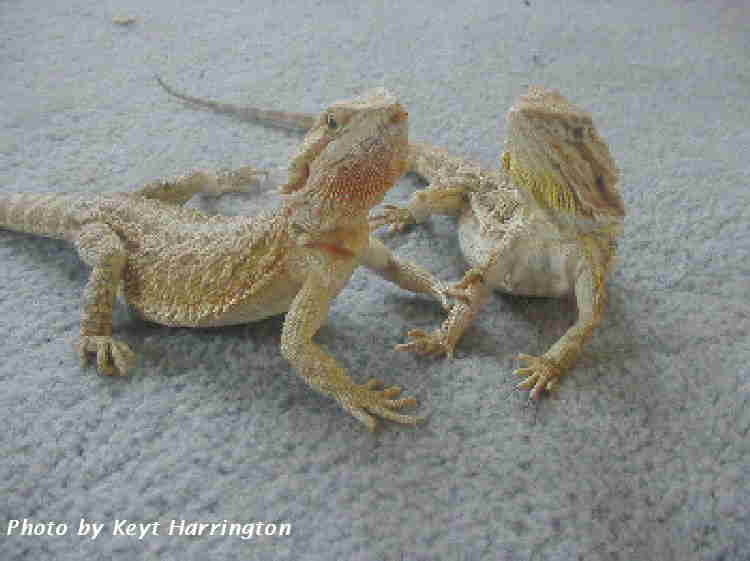 A few years later, my boyfriend and I went to a local reptile show just for the fun of it, and there were many tables selling Bearded Dragons. My boyfriend at the time was from Australia, and he knew how badly I wanted a Dragon. To my surprise, he was kind enough to purchase a tiny, 3 month old male Dragon for me! I didn't know much about Dragons at the time, but thanks to the internet and the local pet store, as well as my wonderfully kind and patient 'first born', Ozzie, I have learned a lot! So, here we are almost 3 years later, and Ozzie is a beautiful 2.5 year old with 6 other Dragon relatives, and 12 babies of his own!